Revd June Steventon I am considering a special service in 2008 to mark the centenary. My Great Grandfather James Walkden lost his life in the Maypole Disaster 1908. We have the original postcard depicting the photos of the "men who lost their lives" and am wondering what year this post card was issued? Hopefully someone can determine the date of this postcard's production. 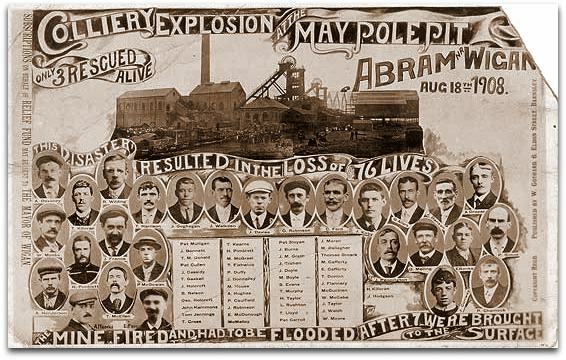 The postcard was produced by Warner Gothard of 6 Eldon Street, Barnsley, Yorkshire, England within about ten days of the event taking place, Warner Gothard is described as a "photographic artist" and the disaster montage postcard was his speciality and produced between the years of 1908 to 1916. He had studios in Barnsley, Wakefield, Leeds, Halifax and Dewsbury. The victims were often shown in the clothes that they were married in as these were the photographs which were readily obtained from the family of the deceased. White Lea company owned by Henry Ellison who were manufacturing Lyddite, an explosive chemical used in artillery shells in WW1. Heckmondwike and Hoyland Silkstone colliery, Barnsley. These postcards sometimes turn up on Ebay. I grew up with the stories of my mother's Uncle Avie (Austin Devaney) who died in the Maypole Pit Disaster. It was not until about 1983 that I had a chance to take my mother and her older Brother to see if we could find anything in Wigan about the event and found out that the 75th anniversary had been celebrated shortly before. We were given directions at the library and were able to visit the site, the house in Platt Bridge, where he had lodged, and the churchyard where he was honoured on the monument. Unfortunately we also discovered that his name was spelt incorrectly as Devanney. On your list the 'v' has been omitted so that the name now says Deanney. Up to that time my mother and uncle had no idea that so many of the men were from Mayo. My grandmother's family were from between Claremorris and Knock at a place they referred to as 'the Line'. It is good to know that this information is now available on the internet but would it be possible to amend the name so that if anybody was researching the site they could find him, Deanney looks quite different to Devaney. Incidentally Austin's brother in Boston called his son Austin, and his sister's son in Milton NH called his son Austin also. The first of these has passed away but the second is now in his 60's. Austin Devaney, my great uncle, died in the Maypole Mine Disaster in 1908, was the brother of my grandmother Katie Devaney. To my knowledge she had at least 4 brothers, Willy, Austin, Henry and Martin and 3 sisters, Marie Nora and Ellen. Willy Devaney remained in Ireland and had 1 daughter May. Marie, Henry, Nora, Ellen and Martin all emigrated to the USA, probably in the late 19th or early 20th century. I was told Martin died. re-married ****** Kendall and had another child. I have visited Maine and New Hampshire and met many of this stem of my family. One of her grandchildren is called Austin. Nora married and became Gildea. Ellen's married name was Buckley, I think, and I think she may have had a son called George. Henry had a son called Austin who I also met in Boston in 1984. He lived somewhere near a race track. I also met his daughter who lived outside Boston. At the time I was visiting the daughter of my Grandfather's brother. This side of the family remembered going on a regular basis to meet up with other members of the Irish community in Milton, Mass. Although I know some of these names I can only ask one remaining aunt now in her 80's. Another name I regularly heard about was Winnie Devaney, who I think was a cousin, connected with Milton and also Dorchester but I don't believe she had any family. My grandmother Katie also spent some time in Maine with her sister between 1912 and 1916 before returning to Claremorris. She married Patrick Vahey, my Grandfather (died 1920) and remarried John Grogan. There were 3 children from the first marriage and 2 from the second. I am researching my family genealogy. My GGG grandfather and GGG grandmother were from Claremorris Mayo Ireland. They had a son named Austin Devaney. The age of this miner at the time of his death matches that of their son Austin. I am wondering if you have information regarding the parents of Austin. I would greatly appreciate finding out if this is indeed their son and my relative. Also, you received an email from a Wendy Milner re-Austin. The information she states not only matches my family history, it leads me to believe she may be related and this is in fact the same Austin. There is no link allowing me to contact her. Are you able to put us in touch? I would greatly appreciate your assistance. Thank you for your informative pages on this disaster. My wife's grandfather Edwin Nelson was the assistant manager on the day and led the resue team into the mine. He was one of those awarded the medal (which is still in the family). Do you have any information on the six special medals that were given by the company to the mine rescuers? The Mining Museum librarian did not know of them (and they were not awarded the Edward Medal). We now know that Edwin (often referred to as Edward) Nelson was given a presentation inscribed watch by the company in recognition of his efforts on the 18th August 1908 , but we have no evidence of a medal apart from 'family memory'. Presumably someone somewhere has a record of the six awardees? Possibly the Mining Rescue organisation?? I have also read the official legal report of the Coroner's Inquest (including Edwin Nelson's testimony) and have a copy of the Report of Inspector of Mines after the Coroner's verdict was made. His brother Herbert Nelson was amongst the dead. Edwin and his family emigrated to a mine managing position in New Zealand in 1911. We hope to visit the area in June this year. Don Battley and Eleanor Battley (nee Nelson) from New Zealand . We actually went to the site last week to photograph it, and to view where Edwin Nelson lived in Abram, and we also visited the National Mining Museum to investigate further. I am considering a special service in 2008 to mark the centenary. My name is Revd June Steventon and I am the Vicar of Abram and Bickershaw. I would like to contact Joe Mullarkey who, on your site, has been asking for information. 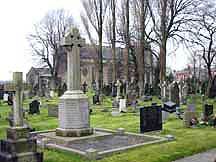 As the Memorial is in Abram Churchyard I have begun to think about having a special service in 2008 to mark the centenary. If I could link with anyone else who is thinking of doing something, then I think that would be a good idea. Could you let me have the email address of Joe Mullarkey?